Now that most of the construction work on the layout is complete, we are finding ourselves with more opportunities to actually run some trains. So, I thought it would be a good idea to feature, during the coming weeks, all of the rolling stock that we use on our various trains, beginning with the coaches. I must admit that we do have several rakes of coaches, in various liveries, which means that we can run a wide variety of passenger trains. 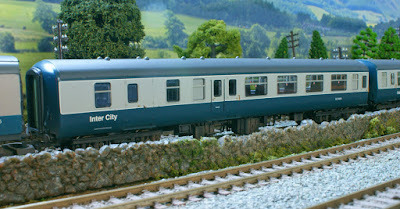 The majority of the coaches are Lima Mk1s as they tend to be more forgiving of some of the less than perfect trackwork encountered in some locations on the layout. However, having said that, I will start with the most modern coaches that we use, namely the Bachmann Mk2s, together with some Lima, Hornby and Mainline 'oddities'. 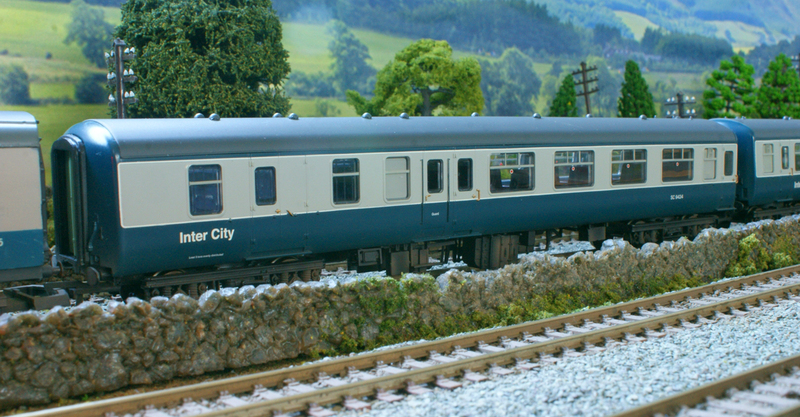 First up is the Bachmann Mk2 Brake / Second Class Open Coach (BSO). 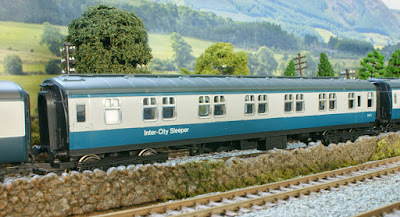 We have two of these coaches, both with the Running Nº SC9424, which means that it was a Scottish Region coach. The Bachmann Catalogue Nº is 39-381 and they date from 2006. Next up is a Tourist Standard Open coach (TSO), of which we have four, three with the Running Nº 5361 (39-361) and one with the Running Nº 5311 (39-351). All models date from 2006. We have only the one Mainline Buffet / Restaurant Car, primarily for use with the Mk2 coaches. The Running Nº is M1709 and the Catalogue Nº is 37-113. 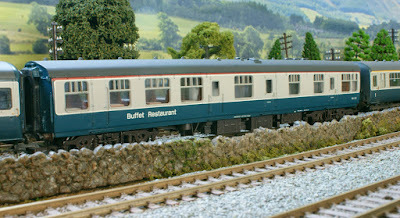 This particular model dates from between 1981 and 1984 and is a really nice coach, for its age, and is always popular with passengers serving, as it does, a variety of hot meals, teas, coffees and light snacks. Now, for those passengers who wish to travel in greater luxury, we also have two of these First Class Corridor coaches, one with the Running Nº S13393 and one with the Running Nº E13472. Their respective Catalogue Nºs are: 39-330 and 39-340. Both models date from 2006. Another coach that we often use with the Mk2's is this Lima Full Brake coach of which we, again, have two. Both have the Running Nº M80855, Catalogue Nº L305343 and this model dates from 1977. 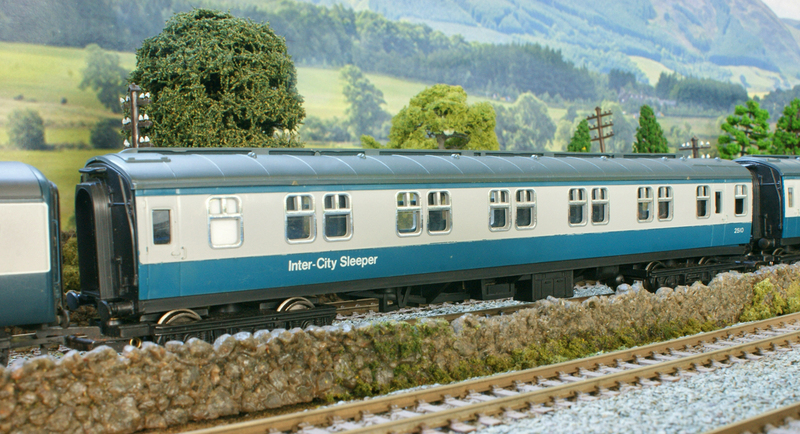 Finally, for now, we have four of these Hornby Mk1 Sleeping Cars, which we use with either our Mk1 or Mk2 coaches. All have the Running Nº 2510, Catalogue Nº R339. These coaches date from the mid-1970s and are a bit long in the tooth now so, maybe, we ought to start thinking about providing our night-travelling passengers some more modern sleeping accommodation in the not too distant furture!